Australian PM Scott Morrison stresses he has not yet decided to recognize Jerusalem as Israel’s capital, will hold consultations. Australian Prime Minister Scott Morrison on Monday night commented on reports that his government is considering recognizing Jerusalem as Israel’s capital. 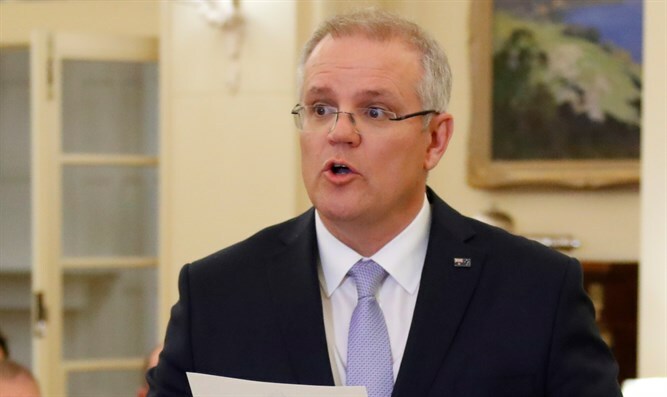 Speaking at a press conference, Morrison repeated earlier comments that Australia is committed to a two-state solution and that the proposal regarding Jerusalem was made by Dave Sharma, formerly the Australian ambassador to Israel. “Australia’s position on this issue has to date assumed that it is not possible to consider the question of the recognition of Israel’s capital in Jerusalem and that be consistent with pursuing a two-state solution,” he explained. He stressed that “no decision has been made in regarding the recognition of a capital or the movement of an embassy” and added that in the months ahead, he intends to “confer with cabinet colleagues” on the issue. Prime Minister Binyamin Netanyahu spoke with Morrison earlier on Monday and thanked him for considering officially recognizing Jerusalem as the capital of Israel and relocating the Australian embassy there. A small but growing number of countries have recognized Jerusalem as the capital of Israel since US President Donald Trump announced that the US would officially recognize the city as the capital of the Jewish State last December. These countries include Guatemala, the Czech Republic and Honduras.